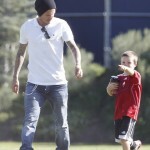 Wearing Dior Homme Jeans, David Beckham watches on as Brooklyn plays a game of soccer in Los Angeles. The soccer star hung out on the sidelines with Romeo and Cruz as they watched their big brother play. I love Bechham, he is always my idol for these years, as for the jeans, really nice and handsome.